Recently we’ve added an ability to trigger the notification on specific columns change. 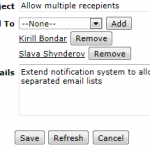 For example, you want to be notified only when a Task’s Status field is modified. To add conditions like this, select the "Specific column(s)" option to display a list of columns. Turn on the checkbox(es) next to the column(s) you want to know about. When you turn on a column’s checkbox, any alteration to that column triggers an e-mail.